FOUR WORLD RECORDS! Across the Continent in 67 Hours. Canadian National Railways was among the earliest users of diesels in North America establishing a number of records. It began late in 1924 with a tour of Europe by CNR motive power officials including C.E.Brooks, Chief of Motive Power, their last stop being at the Glasgow, Scotland plant of the Wm.Beardmore Co. builders of airship (dirigible) motors. These very lightweight (other existing diesel engines weighed double to triple) and very advanced design engines were already being used in London, Midland & Scottish Ry. rail cars built in 1922. Thus began an odyssey that was to last for more than 35 years until complete dieselization took over in 1960. First use of the Bearmore diesel was in a number of "oil-electric" self-propelled cars put together at Pointe St. Charles shops using car bodies built by Ottawa Car Manufacturing, with National Steel Car trucks. The first car was 15819 with a 4-cyl. 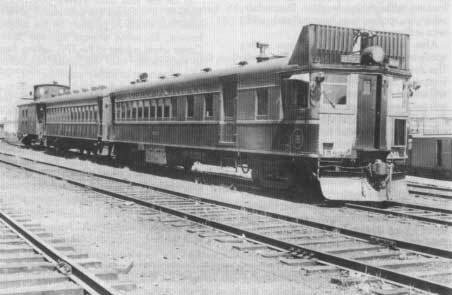 185HP engine, out-shopped Aug.25,1924, followed by two 102' 126 seat, articulated cars with 8-cyl. 340HP engines, 4-100HP Canadian Westinghouse traction motors and SKF roller bearings! The engines were later re-rated to 200HP and 400HP with no difficulty. Then came 15820 on November 1,1925, destined to set a world record long before the 1,015 mile Denver to Chicago 13 hour run of Burlington's "Zephyr" of May 26,1934. Sunday, November 1, 1925 car 15820 set off from Bonaventure station in Montreal for its epoch-making 2,937 mile 67 hour run to Vancouver. Three world records were broken on this trip for endurance, economy and sustained speed over such a distance. With only minor delays and problems enroute the durability of the Beardmore diesel was proven to all, never having been shut off! 15820 was then assigned to the British Columbia District. A total of 19 Beardmore diesel engined-cars were acquired between 1925 and 1931 inc. 9, 6-cyl. 300HP units. These joined an all-time roster totaling some 70 self-propelled cars of various propulsion including, steam, gasolene, battery and diesel, from rail buses to 3-car train. The largest roster total was 63 cars in 1921, making Canadian National one of, if not the biggest users of self-propelled cars in North America. Only one of these self-propelled cars remains in existence, 15824 built February 13, 1926 with a 4-cyl. 185HP Beardmore, and re-engined July 1943 with a 6-cyl. 175HP Cummins engine. It was donated to the CRHA in June 1964 and has operated at the CRM with 15767 a trailer car originally Central Vermont 151. The only other Canadian "doodlebug" in existence is ex C&GT 405 which was a Brill car acquired from New York Central, M-405, presently on the Delaware & Ulster Rail Ride, an isolated tourist line in New York. Beardmore engines also powered Canada's first diesel locomotive, a two-unit 2660 HP road engine built in 1928 for passenger service. It too set a record as the most powerful internal combustion locomotive in the world. In 1956 operated two roundtrips with a trailer between London and Sarnia. 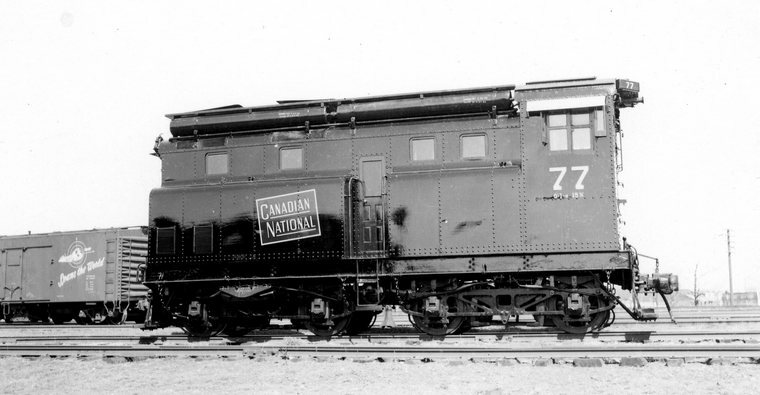 Canada's first diesel locomotives were also North America's first passenger road locomotives, a unique pair of single end box cab units totally 94' in length, the only two built, with a unique 2-D-1 wheel arrangement, designed for passenger service, they were built in November and December 1928 (but not accepted by CNR until 4/29), by Canadian Locomotive Company, Kingston, as a joint CNR, Westinghouse Electric & Manufacturing Co. (WEMCo.) and Baldwin Locomotive Works design with Commonwealth Steel underframes. Weighing a heavy 334,000 lbs. each they were equipped with a powerful 12cyl. 1330 HP diesel engine by Wm. Beardmore Co., Glasgow, Scotland. This was the same company that provided engines for many CNR oil-electric self-propelled cars including CN 15820 which in November 1925 made a record breaking 2,937 mile run across Canada in just 67 hours proving the durablility of the Beardmore diesel. These powerful units were built at a time when most diesels were being built in mere hundreds of horsepower. The first unit started testing on November 20,1928 and went on to operate in local passenger service. 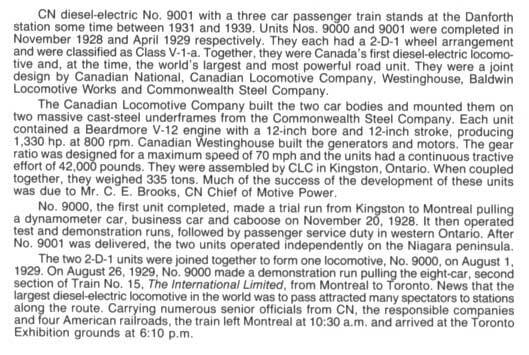 The second unit was accepted by CN in April 1929 and on August 1, 1929 the units were joined together. On August 26th 9000 hauled an 8 car Second 15, The International Limited from Montreal to Toronto. 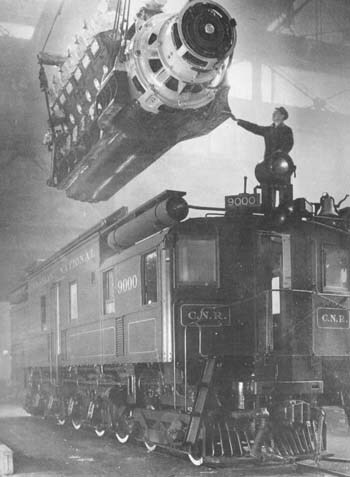 9000 worked Montreal-Toronto passenger service until 1931. 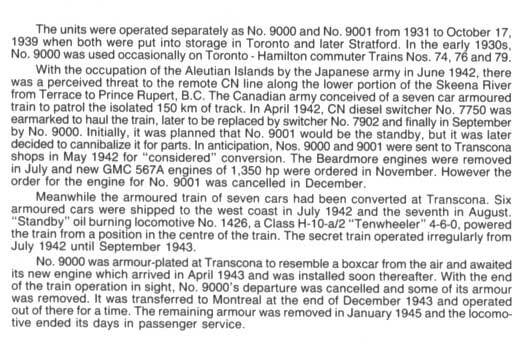 The units were separated and the second one given its own number, 9001 and operated separately from 1931 to 10/17/39 when both went into storage after having been in use out of Toronto including 9000 on Toronto-Hamilton commuter trains. 9000 was given armour plating in 1943 for a unique secret 6 car World War II military armed train operating on the remote northern CNR line to Prince Rupert, BC not far from Alaska. This on account of Japanese action in the nearby Aleutian Islands. At this time it was re-engined (4/43) with an EMD 16-567A rated at 1440 HP and weighed 326,000lbs. The re-engining of 9001 was cancelled. Following the end of the secret armoured train operation 9000 was transferred to Montreal at the end of December 1943. In 1945 the armour plating was removed and the unit returned to passenger service, this time in New Brunswick until 5/46 when both units were retired and tragically were scrapped. Canada's first diesel locomotives are just a memory. It was re-engined 9/1953 with a 500HP V-12 Caterpillar, later derated to 380HP. It was first used at Turcott Yard in Montreal. It was transferred to Toronto and was there in October 1948. In 1958 it became a spare unit to protect tiny Thousand Island Ry. 500, something it had already done just prior to August 1952 when 500 was sent to Stratford for repairs. It was leased to The Canada Starch Co. Ltd. (CASCO) at Cardinal Ont. for their short private line from 1962 until 1966. It was donated 4/1968 to the CRHA and is at the CRM. Another one-of-a-kind in Canada this unit was built 8/1932 at CNR's Pointe St.Charles main shops in Montreal to a double end box cab design similar to US built ALCO-GE-IR 100-ton boxcab units. It was equipped with twin 300HP 6cyl. Canadian Ingersoll-Rand, Sherbrooke, Que. diesels and Canadian General Electric, Peterborough, Ont. electrical equipment, weighing 117 tons. It operated in Toronto and was transferred to Turcot Yard in Montreal. It was involved in a wreck January 12,1946 with CNR 7903 NW2 diesel inside Mt.Royal tunnel and was burned. It was retired 12/48 with the intention of building a new unit using components of 7750 and 7903 but this was cancelled and both were finally scrapped 5/49. 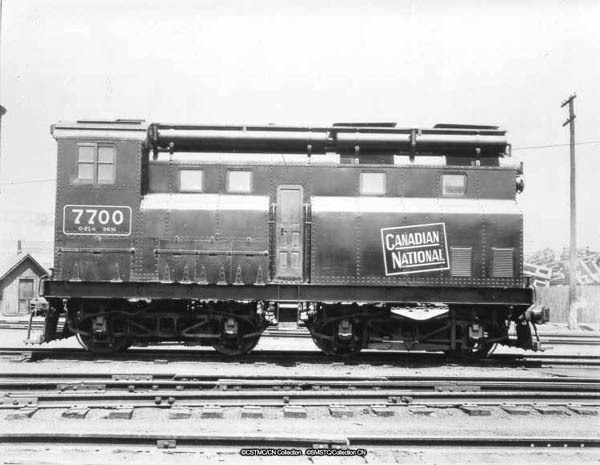 CNR's next diesels were 7936-7945, ten production line EMD NW2's built 11,12/1946 in the US. 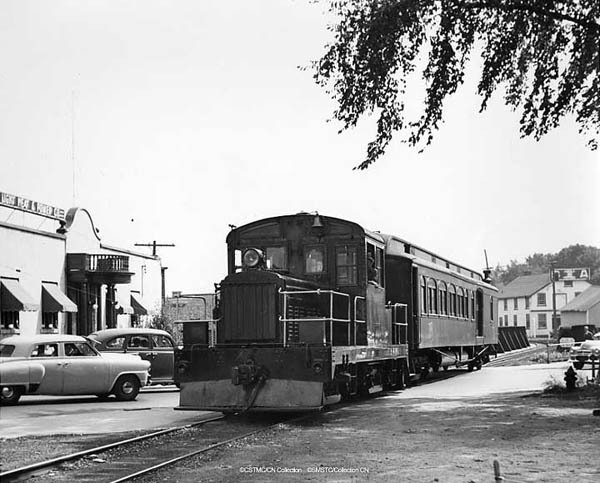 Thousand Islands Ry 500 typical passenger train, 1948. Thousand Islands Railway 500, one-of-a-kind homebuilt diesel rebuilt by CN owned-Oshawa (electric) Railway from an electric locomotive. Trucks and traction motors from Oshawa 42 were utilized along with twin 125 HP Waukesha gas engines. Other parts were provided by Whitcomb, who assigned it their builders number 50006 12/30. 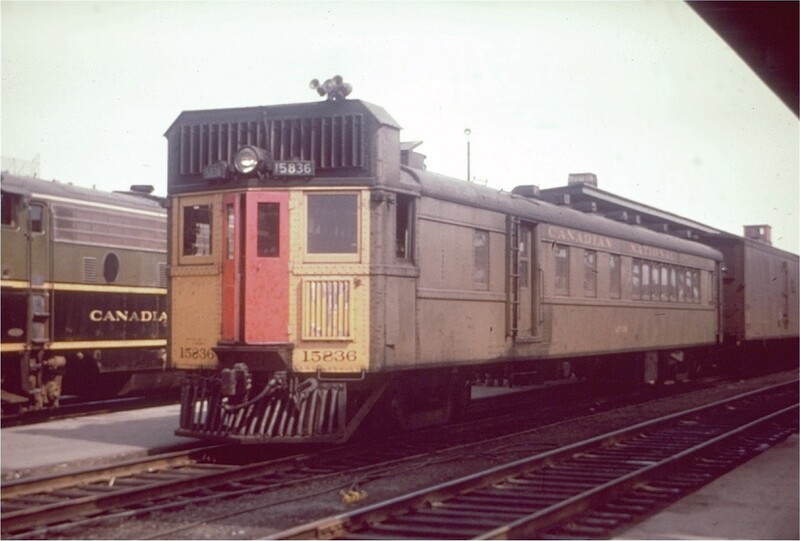 This tiny 35 ton unit operated briefly on the Oshawa Railway before becoming Thousand Islands 500 in March 1931 where it operated on the tiny CN-owned railway. In 1947 it was re-engined with twin 142 HP Cummins diesels. 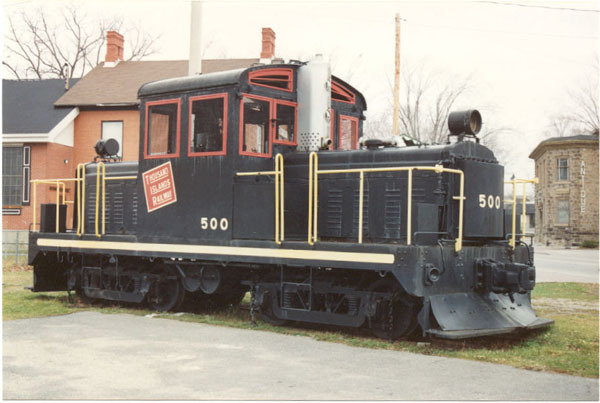 It was retired in April 1963 and finally put on display in April 1966 in Gananoque where it ran most of its life. 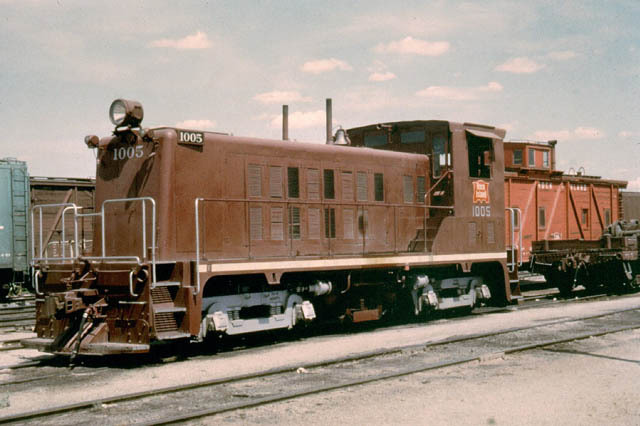 Early diesels were for the most part yard switchers, a service where the greatest savings could be realized due to the low speed stop and go nature of yard switching. High availability was another factor in favour of diesels which could operate around-the-clock with little attention. A steam locomotive needed water about every four hours and once a day it had to be taken to the shop to get coal, have its fire cleaned and be greased and inspected. A replacement locomotive would be provided for three shift jobs using a "herder" or "scout" crew consisting of only an engineer and fireman, to exchange engines. This was a sought-after high seniority job. Diesels on the other hand could go for days on a tank of fuel oil and routinely went to the shop once a week for inspection and servicing. 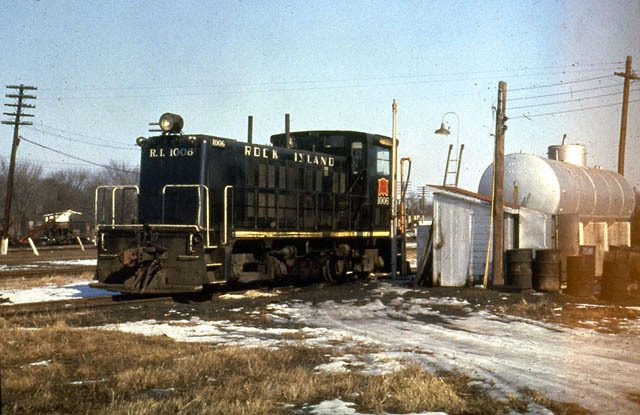 Aside from yard switchers, some of the earliest road locomotives were small units used on branch lines in isolated situations. Canadian National dieselized an isolated operation on Prince Edward Island. Here, smaller units were considered suitable due to the lack of heavy grades such as on the E&N. 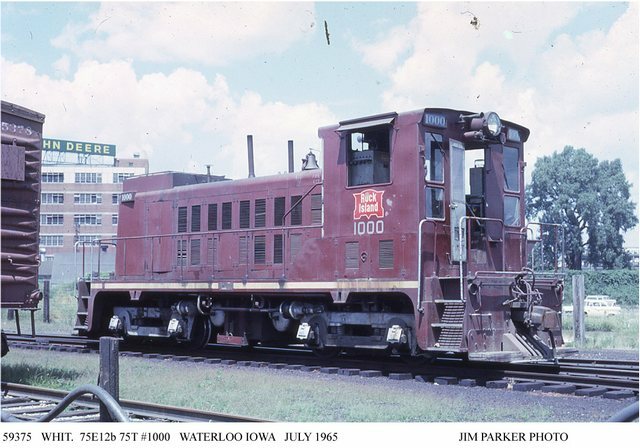 It chose 18 75-ton 650 HP units (CNR 7803-7820) built to Whitcomb Locomotive Works (Rochelle, IL) designs by Canadian Locomotive Company in Kingston. By this time Whitcomb was a division of Baldwin Locomotive Works. Ordered in February 1947, it was not until April 1948 that the first two units were delivered. Slow delivery of the units allowed time to evaluate them in operation, unfortunately frequent road failures due to defective engines resulted in the refusal to accept some units in use, to return those it had and to cancel the remaining 11 units. The Sterling diesel engine was an 8 cylinder 8x9 engine operating at 1200 rpm and rated at 650 horsepower. The unit itself was rated at 37,500 pounds t.e. and weighed 75 tons. It suffered from a poor design that failed in use. 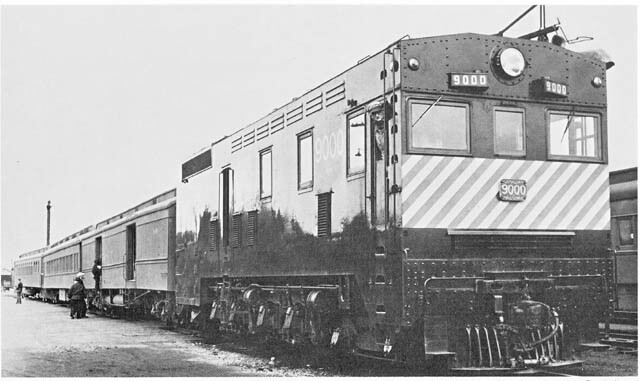 The units were sold by CLC to Whitcomb in January 1949. Whitcomb then re-engined the locomotives with 550 HP Caterpillar D-397 engines. Seventeen were re-sold to the Rock Island (1000-1016) where they performed satisfactorily with some lasting until 1970. The other unit was sold to the Washington & Old Dominion 55. Rock Island 1006 Bureau Jct. IL. February 1958 Collection of Paul Mc.Grane. 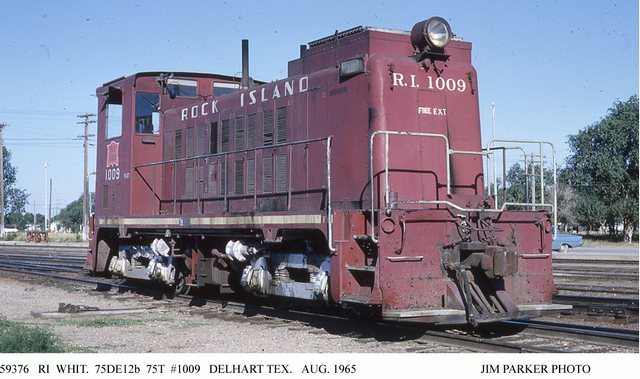 Rock Island 1005 at Fort Worth, Texas June 1964. Collection of Paul Mc.Grane. Meanwhile, CNR placed an order with MLW for eighteen GE 70-tonners with Cooper-Bessemer 6 cyl. 550 HP engines. These locomotives proved reliable and long-lasting, many lasting for twenty years, with the last three being retired in 1983. Re-numbered in 1956 to 26-43. 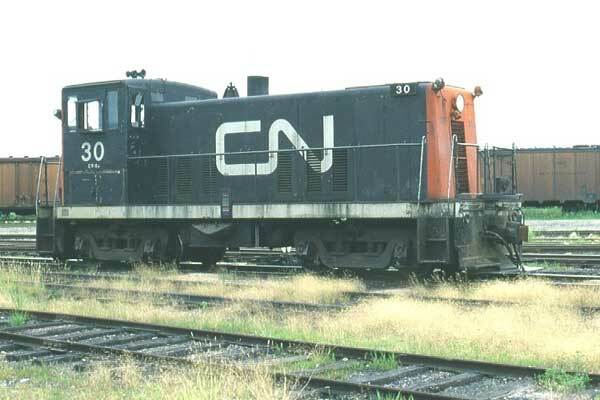 Some went to shortlines or industrial use and eventaully two, the first and the last, were preserved, 30 (below) at the Canadian Railway Museum near Montreal and 43 (as 7817) in Prince George BC. GE 70 tonners at work on Prince Edward Island. Central BC Railway & Forestry Museum in Prince George.